Florence Kennedy offers a unique, modern approach to flower arranging: breaking away from the stiff structure and formality of traditional floral displays, her floristry style is practical, accessible and achievable. In Flowers Every Day, Florence shows how to create stylish flower arrangements at home. 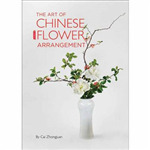 Being with Flowers contains guided meditations and step-by-step floral arrangements to help you explore your relationship with flowers. In this invaluable book Paula shares her colour secrets. She explores colour influences, the psychological effects of personal responses and gives very practical tips based on her own experience and skills on how to use and combine colours.